Faced with unrealistic targets for post-war peace and stability, "good enough" becomes the new goal of US policy. It is axiomatic in warfare that the overall goals of a campaign and the strategy to achieve them should be determined in advance of decisions regarding the resources - money, equipment, people, time - to be applied. It is the former which must dictate the latter. And if it should transpire that, for one reason or another, the resources necessary to achieve one's goals are not available, then both the goals and the strategy need to be adjusted accordingly. As the Obama administration prepares for yet another wholesale change of military and civilian command in Afghanistan, and as the clock ticks down on the July 2011 deadline for the promised beginning of a US withdrawal of troops, it is becoming increasingly clear that the US project in Afghanistan is going to change. And although we are told that there is considerable controversy within the administration, breaking largely along military/civilian lines, as to the size and pace of any drawdown of US troops between now and the end of this calendar year, it is nonetheless clear that US resources devoted to the effort are, one way or another, going to decline. If one lengthens the time horizon slightly to 2014 - much closer than virtually anyone cares to admit - the consensus of the US, NATO, and even the Afghan government is that foreign military involvement in Afghanistan will be reduced by then to much lower, indeed minimal, levels. If things were going along swimmingly in Afghanistan, this would be no problem. Even taking a "conditions-based" approach to a drawdown of foreign troops, as the Obama administration has insisted all along it would, improvements in security and governance in currently contested parts of the country would permit Afghans to assume responsibilities currently carried by foreigners, permitting the seamless and progressive departure of the latter. That's the theory. But things are not going swimmingly in Afghanistan. Responding to questions from the Senate Foreign Relations committee just over a week ago, Ryan Crocker, the new US Ambassador-designate to that country, compared his upcoming task there unfavourably with that which confronted him in Iraq, where he served as ambassador during the worst of the fratricidal violence of 2007 and 2008. As for the prospects of success for the US-led counterinsurgency campaign in Afghanistan, the best he could say was that the task was "not impossible". He may actually have been trying to exude optimism. Speaking at the same hearing, Senate Foreign Relations committee chairman John Kerry, a strong supporter of the administration, and often employed by the White House as an emissary to both the Afghan and Pakistani governments, was scathing about current US policy. The US commitment in Afghanistan, he said, "in troops and dollars, is neither proportional to our interests, nor sustainable". On the same day, the same Senate committee released a study, some two years in the making, of US development assistance to Afghanistan. Such assistance, it said, amounting to some $19bn since 2002, is probably doing more harm than good. Spent disproportionately in the violence-wracked south and east of the country as a means of building quick popular support for the Afghan government and its foreign benefactors in areas recently cleared of Taliban insurgents, and often disbursed with woefully inadequate oversight in areas where there is little or no Afghan governmental structure to manage it, such aid money is overwhelming local institutions, encouraging a culture of corruption and aid dependency. According to the report, even where there are immediate benefits associated with US projects, the results are often unsustainable by local officials, who lack the expertise to operate or the money to maintain them. US foreign assistance to Afghanistan currently constitutes an astounding 97 per cent of that country's gross domestic product; when it declines, as it inevitably will, an economic depression is likely to result. On the security front, even the US military, understandably eager to tout the positive results of its counter-insurgency "surge" in Helmand and other parts of the Pashtun South, is careful to characterise its gains as "fragile and reversible", while nervously eyeing the deterioration of security further east - due in part, perhaps, to the influx of fighters pushed out by the US military elsewhere - and hoping it will be allowed to shift surge forces there, rather than sending them home. Almost no one makes any claims for improvements in Afghan governance, either in "cleared" areas, or much of anywhere else. And there is a growing, if still grudging, willingness to admit what has long been obvious: That the Afghan Army will not be anywhere close to being capable of assuming security responsibility for the entire country by 2014, and that even if it were, the Afghan government will simply not have the resources to sustain such a large force when the foreign armies depart. And yet, nowhere is the administration suggesting that a change of strategy is in order. Those pressing for a relatively large initial drawdown of US troops, on the order of 15,000 of the current complement of 100,000, generally do not make a concomitant demand for a complementary change in strategy. It appears, instead, that they would prefer to compensate for a losing strategy by denying it resources. This, of course, is a prescription for disaster - but one consistent with the path laid out by the US president. 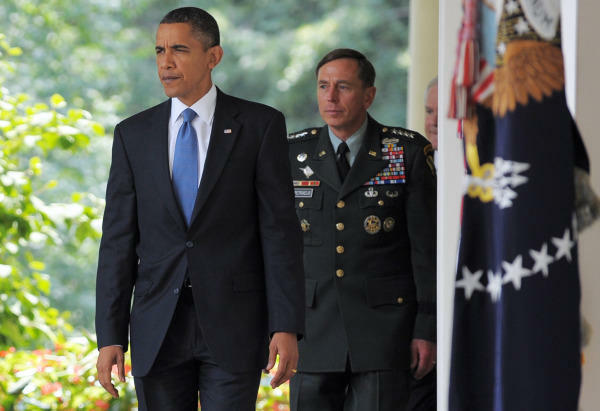 The evolution to date of the administration's policy in Afghanistan does not reflect well on President Obama. Having politically painted himself into a corner by embracing the struggle there as a "war of necessity", unwisely overlooked by his predecessor in favour of a "war of choice" in Iraq - which he himself had opposed from the start, Obama rather sanctimoniously pledged to commit the resources necessary for a highly ambitious program of Afghan nation-building in March 2009. His ardour for the project waned considerably, however, just five months later, when he was informed by his newly appointed Afghan commander, General Stanley McChrystal, that the price tag of a successful counter-insurgency would be 40,000 troops higher than expected - and that even then, success was not assured. Clearly working against his better judgment, but politically committed to a counter-insurgency course, Obama struck a fateful compromise: He would largely acquiesce to the military's immediate resource demands and stick with a comprehensive counterinsurgency strategy, but deny his forces either the time or the sustained commitment of resources necessary for such a US-led strategy to succeed. In short, he would violate the iron rule of war planning, completely separating resource considerations from consideration either of goals or of strategy. To square this contradiction, he would simply insist that the transition to a large Afghan security force, never realistic in the first place, be accomplished far more rapidly than originally planned. Interestingly, both US military and civilian officials, not entirely unmindful of the inconsistency between the ambitiousness of their nation-building goals in Afghanistan, and the inadequacy of the time and tools available to achieve them, have begun to modify the language they use to define success. From Ambassador Crocker's testimony, as well as from recent statements by senior Department of Defense officials, it would appear that "good enough" is the order of the day. The aim of institution-building in Afghanistan, according to Crocker, is "good-enough governance". Senior uniformed military commanders, meanwhile, have taken to referring to "Afghan good enough" as their largely undefined new standard. Such suggestions that the US may be scaling back its unrealistically ambitious expectations for Afghanistan are welcome - but they do not equate to an implementable strategy. Indeed, there is no sign that the administration is pursuing a genuine course correction in Afghanistan. Its current hope appears to be that the Taliban will acquiesce in a negotiated settlement which will save the Americans from the consequences of their folly. That is unlikely to happen. Meanwhile, as internal US pressure builds for withdrawal, the day of reckoning - when the gulf between US aims and means in Afghanistan becomes impossible to ignore - looms ever larger. Such, as they say, are the wages of sin. Robert Grenier retired from the CIA in 2006, following a 27-year career in the CIA's Clandestine Service. He served as Director of the CIA Counter-Terrorism Center (CTC) from 2004 to 2006, coordinated CIA activities in Iraq from 2002 to 2004 as the Iraq Mission Manager, and was the CIA Chief of Station in Islamabad, Pakistan before and after the 9/11 attacks.